Over the last few months, I’ve told a lot of people that I’m thru-hiking the Appalachian Trail. I haven’t kept a tally of their reactions. But if I had to estimate, I’d say that at least two-thirds of people respond with some predictable variant of concern, shock, or complete lack of understanding for why anyone in their right mind would want to do this. It’s understandable and comforting that people I know are this concerned about my safety. I know that to someone who has never done a long-distance hike, it’s their first instinct to worry about something bad happening to me. It’s an unnatural activity in a world swathed in comfort and convenience. I get that. Thru-hiking is objectively weird. The brain goes to dark places when confronted with an adventure on such a large scale of time and distance. Despite being appreciative that my loved ones care this much my survival and well-being, I have become very tired of answering these questions. In talking with fellow hikers, I have discovered that many of them deal with these same concerns. So here, I would like to give a brief primer of my collected answers to the standard safety questions, in the hopes that it will (a) explain my rationale to my own circle of loved ones, and (b) help other aspiring thru-hikers assuage their own friends’ and families’ fears. Question One: Are You Carrying a Gun? No, absolutely not. If you know me, you already know my opinion on this. Regardless, let me provide you with some rationale from other sources for my lack of firearm. Other writers on The Trek have already spelled out very detailed and well-argued reasons why it is not necessary or advisable to take a gun on the AT. For excellent examples, see the following: Am I Taking a Gun on the Appalachian Trail? and Do You Need a Gun on the AT? In general, the common, non-hiker logic goes like this: There are creepy people and scary wildlife out there. You need to protect yourself. The reality, however, is much different: Bears are not likely to approach humans, since they mostly only want food (I’ll get to this shortly). As for creepy and potentially dangerous people: yes, they exist around the AT, just like they exist everywhere else. But statistically, the trail is a low-crime area. While unfortunate tragedies have happened in the past, one is far more likely to encounter a dangerous situation in a city or—even more frequently and unfortunately—by someone they know. The tight-knit community of hikers, business owners, trail angels, and volunteers surrounding the Appalachian Trail is significantly more safe than an average situation in, say, a city. For more on this issue, see question three below. While some states and national parks allow the carrying of firearms, the Appalachian Trail Conservancy still discourages carrying a gun. As other writers on The Trek have stated, the extra weight just isn’t worth it—guns and ammo are heavy, and a completely unnecessary addition to a backpacking kit. Additionally, and perhaps more convincingly, guns create distrust and wariness. Most thru-hikers don’t carry firearms. If you’re one of the few who does, you’re likely to alienate or frighten other hikers. Community and fellowship are some of the most beautiful elements of long-distance hiking, and I would not want to do anything to risk that connection. Question Two: What About Bears? Bears don’t want to murder you. They just want your food. Say no! Common logic imagines bears as malevolent, violent creatures that will attack humans whenever they get the chance (I’m looking at you, The Revenant). I don’t know much about grizzlies, admittedly, but I’ve never hiked in an area populated by this kind of bear. On the Appalachian Trail, if you run into a bear, it will most likely be a black bear. These bears are wild, yes, and safety is warranted, but they are not likely to attack a human. I encountered a black bear on the John Muir Trail two years ago, and the second it heard me coming, it lumbered off, up a hill, and out of sight. The ATC provides guidelines for dealing with bears, the most important being food storage. I was originally planning to rely on a simple but old-fashioned storage method: hanging my food every night. However, after reading Andrew Skurka’s article on why hanging food is not effective, I was thoroughly convinced to buy an Ursack Major bear-resistant bag. Bears can still smell the food inside an Ursack, but the fabric is resistant to their clawing and pushing. Apart from food, bears are rarely a danger on the trail. Another common follow-up question about bears is, “Are you taking bear spray?” Again, the answer to this is a solid no. If arguments on hiker forums are any indication, most people say this is totally unnecessary weight. Proper food storage is the simplest and most likely way to prevent bear encounters; it’s extremely rare for a bear to approach a human or a camp for any other reason. This may be different in other areas, however; I have heard that it is more necessary and effective in grizzly country. On the AT and with black bears, it’s not needed. Question Three: What About Creepy People? I typed in “creepy gif” to Google and this is what came up. If you see him on the trail, maybe run. Julia Sheehan at The Trek recently wrote a great post about this same concern. My answer to this question usually relies on statistics to explain how unlikely it is for something of this magnitude to happen to me on the trail. Yes, I’ve heard about the notorious Appalachian Trail murders that have happened since 1974: all ten of them. They’re scary, disconcerting, and uncomfortable to think about, like any murder. But as Julia discusses, this number is minuscule when compared with the average daily murder rate in other places in the United States. A person hiking the AT has roughly a one in 13 to 17 million chance of meeting a violent end on the AT. Once again, statistically the most dangerous part of outdoor recreation is the drive to the trailhead. That being said, I’m aware of these issues. I know that violence happens, and some things are unpredictable. That’s why I plan to abide by the Appalachian Trail Conservancy’s guidelines for safety. If I am in an uncomfortable situation, I will trust my gut and take steps to protect myself. I’ll be aware of my surroundings and use common sense. I’ll remember my self-defense instruction. My friends and family have received my planned itinerary and will know where I am and where I expect to be. I won’t tell people I don’t know where I’m stopping for the night. Prevention and common sense are key, and I will use them. Question Four: Aren’t You Scared? Hiking, like anything, involves risk. But look at the reward. 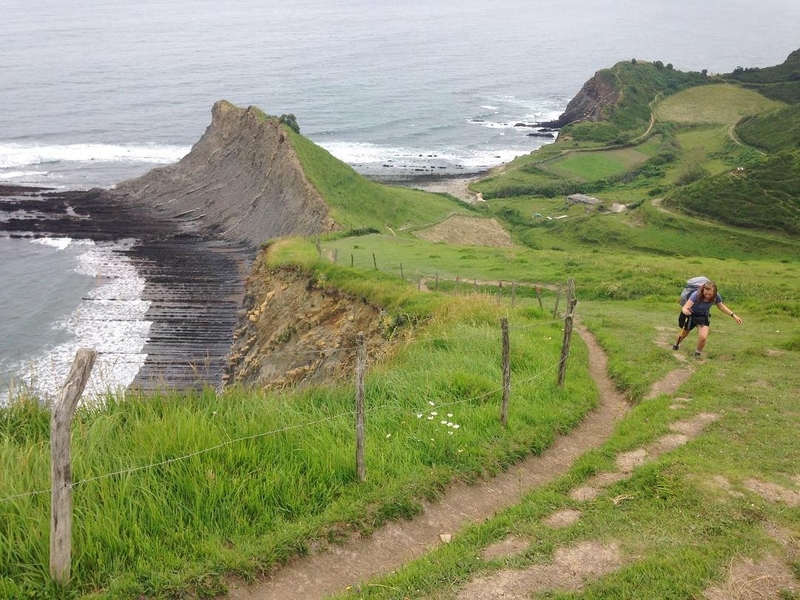 This is in the Basque country, in the north of Spain, approaching the town of Deba. I’ve heard a few people call me “fearless.” Nothing could be further from the truth. I woke up one night a few weeks ago from a nightmare in which my legs were covered in ticks. The next day I bought a huge bottle of permethrin and immediately began to read up on tick-check methods. A few days before that, I woke up in the middle of the night wondering how my single-wall tent would handle all the rain. I’m afraid of my achilles flaring up again, I’m afraid of rolling my ankles and plantar fasciitis, I’m afraid of Lyme disease and norovirus and weird drifters wandering into camp. In short: yes, I am scared. It would be foolish not to be scared. It would be egotistical, in my opinion, to walk into the AT with absolutely no concerns, complete confidence, turning a blind eye to all the real risks. But it’s also counterproductive to focus only on the fear. Yes, I’m scared, but I’m also excited, brimming with eager anticipation for all that I will experience. Every day when we wake up and leave the house, we take a risk. We trust that our drive, walk, or bike ride to work won’t end up in a fatal accident. We trust that the car in the right lane will let us over when we’re trying to merge. We take a gamble that we can pass that truck safely. We take the chance that the elevator won’t get stuck, or we won’t fall down the stairs, or we won’t break a bone on a slippery floor. Every move, every moment of being alive is a gamble, a calculated decision hoping for probability of survival. The Appalachian Trail sounds scary because it’s out of the ordinary. It’s rough and uncomfortable and exposed. Staying inside, with air conditioning and heat and TV and a kitchen and protection from the elements, will keep us safe. But what is safety, compared with adventure? What is comfort, compared with living the life that you can’t not live? What is staying with the familiar, compared with stories, miracles, and lessons the trail has to offer? I am fortunate and privileged and so very lucky to be able to embark on an adventure like this, and I won’t let the fear of an unlikely attack stop me from pursuing my dream. I accept the risks, and I walk. I hope you will, too. Hi there! I'm Sarahmarie, and I'm an English teacher, a writer, a crocheter, a traveler, an AT thru-hiker in 2019, and a person who is very bad at concise intros. I grew up in Kentucky but I've also lived in Atlanta, Georgia and Flagstaff, Arizona, with copious time spent traipsing abroad. I've hiked the Camino Francés, Camino del Norte, and Camino Primitivo in Spain, as well as the John Muir Trail. I've been working towards a thru-hike of the AT for many years, and I cannot wait to make the dream a reality this year. I'm obsessed with languages and I love bagels and cream cheese to an unreasonable extent. I look forward to learning from the Trail and from other hikers on this journey. You answered all my questions beautifully. It will be an exciting hike for you. I applaud all your accomplishments and your love for the outdoors. But as one of those who will be constantly worried about you until you accomplish hike the AT have a great time. Be safe and warm. I’d like to wish you the best of luck on your AT thru hike. You appear to be well prepared and experienced; however, I strongly encourage you to use the cable systems in the Smokies to hang your entire pack. I am the wildlife ranger who has to build and maintain them and also the same guy who deals with our nuisance bears. Trust me if you knew the kind of bear management issues we deal with on the AT you would not keep a food bag or pack of any kind in one of our shelters while you sleep. Not trying to scare you but just saying there are very good reasons we require food to be hung in the park and discourage relying on bear canisters or ursacks. Right on, Sarahmarie. The fears most people *think* they have (or think *you* should have) on the AT are wildly overblown.